Surrounded by the gently sloping hills of the Pacheco Pass Valley, Casa de Fruta has delighted and refreshed travelers for decades. 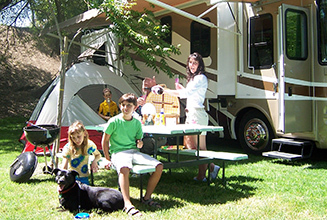 The site includes the Casa de Inn as well as the RV Resort, a 300-space recreational vehicle park. (See Below). Casa de Fruta is also conveniently located near Gilroy, California, home of the world famous Gilroy Garlic Festival in July. Stay with us and avoid the driving and parking hassle by riding the Casa de Fruta 'Garlic Shuttle' to and from the Festival Grounds. 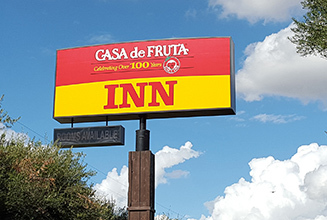 Located two miles east of the junction of Highway 152 and Highway 156, Casa de Fruta is easily accessible from Highway 5 or Highway 101, and is on the way to practically any place you'd like to go, including San Francisco, the scenic Monterey Bay Area, and Yosemite National Park. Additional person charge is $5.00 per person per night. Children under 10 years old stay free w/parent. The right to refuse service is reserved.